Typical example shown. 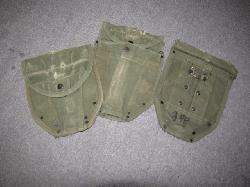 Covers are in several small different variations, but are roughly the same era. They are in fair to good condition. Meant to fit the folding shovel of WWII style.